If you already have a plain lamp base that needs a little panache to brighten it up, then all you’ll need to complete this craft project is a package of theme stickers. This is the easiest project I think I have ever done! And sooooo pretty! I purchased the lamp base at WalMart and though I originally intended on applying a decoupage finish to it, I started with stickers and never continued because I loved the look as it was already. 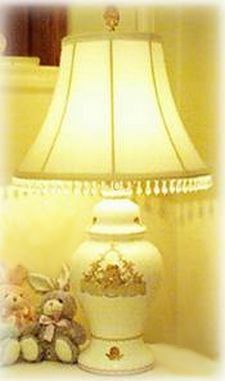 Begin by cleaning your lamp base with rubbing alcohol or white vinegar to remove any oil residue that will prevent the stickers from staying in place. Allow the base to dry and then begin applying stickers as desired. My entire lamp is made using a small portion of one package of stickers and it has been several months since they were applied. They are holding in place beautifully. You can continue this project with a coat of varnish to seal the stickers, but I haven’t found that to be necessary. I may, in the future, apply a fine crackle finish to the entire base, but for now I’m very happy with my lamp.